Collett is a difficult subject: there is a vast amount of material on "his" two major new locomotive classes: the Castles (Caerphilly Castle above) and the Kings, and even on such minor developments as the Hall, Grange and 61XX classes. To anyone born without a personal copper-capped chimney it is difficult to perceive the 14XX and 90XX as developments. During the Collett era someone at Swindon had an obsession with driving wheel diameters and many variants were conceived. In any event there seems to be fairly general agreement that Collett, unlike his illustrious predecessor, Churchward, had no substantial interest in locomotive design. His greatest contributions, other than in the two major classes noted above, were in manufacturing methods, the furtherance of the Great Western's Automatic Train Control system (Collett was a member of the Pringle Committee which attempted to persuade the other companies to adopt a similar system but neglected to do so). The GWR ATC system must have saved many accidents and loss of life. He also appeared to promote the development of diesel railcars: the elegant streamlining of which contrasted with his (?) application of streamlining to one King and one Castle. Testing locomotives on the Great Western Railway. Trans.1st Wld Pwr Conf ., London, 1924, 4, 882-94.8 diagrs. F. Wintour (Mechanical Engineer, Doncaster), presented a report on Franklin's grease for axleboxes. Gresley's view on this was that it was possibly satisfactory at slow speeds; he would raise the matter again in six months' time, Collett meanwhile observed that he had used it on the coaches of the 'Cornish Riviera Express'. ARLE 1926. Collett was born on 10 September 1871 at Grafton Manor in Worcestershire and was educated at Merchant Taylor's School, by which time his parents lived in London..Collett served a pupilage, under Joshua Field, in Maudslay Son & Fieldmarine engineers noted for the precision of their engineeringa quality which appears to have translated itself to Swindon where he became a draughtsman in 1893, assistant works manager in 1900, works manager in 1912, and as Churchward's deputy from 1920 until he took over the CME's position in 1922. He retired in 1941 and as with Webb there is a hint that he was reluctant to leave. He died on 23 August 1952. Westwood stated that although Charles Collett was responsible for the design of two outstanding British locomotive types, the Castles and Kings of the Great Western, he is often regarded as the man whose stick-in-the-mud outlook ensured that Great Western locomotive technology, so advanced by his predecessor Churchward, would be overtaken by other railways. There is some justification for the opinion that Collett merely pursued policies already laid down by Churchward, and did less than he could have done to innovate, but he was far from failing his employers. From Churchward's components and practices he developed a capable range of locomotives and he was not ashamed to reproduce nineteenth-century designs if he thought they were good. Nor was he a dull man, even though his official photographs portray him as such. He, more than most, had a mind of his own. Unlike other Swindon contemporaries, he had not begun his engineering life with the Great Western, but had been a pupil with marine engineers (Maudslay) before becoming a Swindon draughtsman in 1894, In 1900 he became assistant works manager, in 1912 full works manager, and in 1922 Chief Mechanical Engineer. 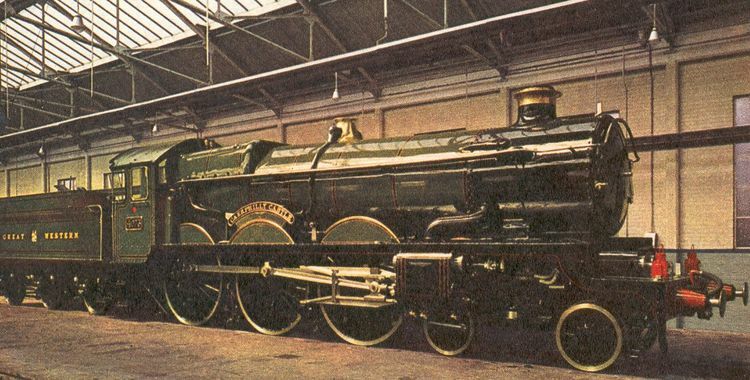 His Castle class was an enlargement of Churchward's Star class four-cylinder 4-6-0 and was even more successful than the latter, becoming one of the classic British locomotives. While preserving the Churchward look, it was somehow more attractive aesthetically, and this was true of most of Collett's designs. Moreover, it could run fast and economically, as was shown by the units that were tried on other railways and by those that hauled crack trains like the Cheltenham Flyer (at that time celebrated as the world's fastest train). It should be added that the Castle class was highly influential on design policy on both the LNER (the oustanding modified Gresley Pacifics) and the LMS (the Royal Scot design owed its origin to the Castle operating on the LMS, although it is worth noting that the Stanier Jubilee class was a pale reflection of the Castle progenitor). K.J. Cook tells how Collett wished to reduce the driving wheel diameter [for the King class] and in this he was fortified by witnessing, while he was travelling from Swindon to Paddington in a non-stop express, the exploits of a 4300 class locomotive, with 5ft 8in diameter wheels, on the relief line which in a short spurt overtook the express on the main line. The Running Superintendent, C.C. Crump, who was travelling with Collett was rather aghast, took the number of the locomotive and said he would take it up with the driver but Collett said "no, don't do that, I was very pleased to see it". Then Collett asked us in the Works to turn out a Castle having new tyres turned down to 6ft 6in diameter which meant turning 1¼ in thickness of steel from the tyres and thus reducing them to a thickness of 1¾ in which was slightly below the scrapping thickness for Castles, but being new tyres and not having been subjected to the hammering which tyres encounter in thousands of miles over rail joints and crossings, it was quite safe for this to be done and the locomotive run for a limited period. So Ludlow Castle, No 5002, was turned out after a general repair with wheel diameter at 6ft 6in and run on the crack trains. It proved to be quite satisfactory and 6ft 6in diameter was settled, as an early fundamental point, in the design of the Kings. The King was an enlarged Castle and was introduced as soon as the civil engineers had finished their programme of main-line bridge reconstruction. Beyond the King Collett could not go, even if he had wished, for the Churchward four-cylinder layout could not be further enlarged within the existing lineside clearances. Among Collett's other types was the Hall two-cylinder 4-6-0. This was essentially a Churchward Saint fitted with 6ft instead of 6ft 8in. wheels, and was the first really capable mixed traffic type to work in Britain (Westwood ignored the 4-6-0 mixed traffic classes on the LSWR which were far more advanced in having external valve gear, and the Maunsell 2-6-0s). It is an over-statement to claim that the Hall class was later imitated by two of the three other British railways: the Stanier class 5 was far more rugged and adaptable. Subsequently he introduced two other smaller but similar 4-6-0 designs (the Grange and Manor classes) which had 5ft 8in, wheels. For branch line passenger work, Collett reverted to an 0-4-2 tank design which had originated in the 1880s. Similarly, for passenger services on light track he fitted the nineteenth-century design boiler of an old 4-4-0 type (Dukes) to the double-frames of the absurdly venerable 4-4-0 (Bulldogs). This hybrid design was chosen to honour certain Great Western noble directors who had indicated they would not refuse to have locomotives carrying their names. However, when it was realized how antiquated these 'new passenger locomotives' looked, the chosen Earls were affronted rather than honoured, and the nameplates were subsequently transferred to new 'Castles'. This incident suggests that Collett was not as humourless as his contemporaries thought; it was just that his humour was of the impassive, oriental kind. Apart from design work, Collett and his subordinates ensured that Great Western locomotives were thoroughly and systematically maintained, while new techniques of construction and assembly meant that they were more precisely manufactured than those of the other companies. However, Collett's obstinate adherence to low-temperature superheat, at a time when new lubricants made high temperatures less wearing for cylinders and when there were ample signs that Great Western locomotives might do even better with larger superheaters, must be counted against him. Cook notes at the beginning of his Chapter 10 that the increase in the mileage obtained between repairs which had been summarised in Chapter seven was a continuing process and followed largely from the introduction of improved methods in the Works and particularly of optical alignment (using Zeiss equipment) and setting of hornblocks and precision grinding of the latter. Swindon was also an early exponent of the welding of copper fireboxes, although as Freebury pointed out the working conditions were extremely uncomfortable, but probably no worse than at Gorton where similar techniques were developed. Nock GWR steam (1972) page 46 records how Charles S. Lake, technical editor of the Railway Gazette had been by Collett for what he considered to be the journals's excessive coverage of the Princess Royal class to which Lake had responded by noting the even greater coverage that Railway Gazette had given to the King class. Nock (GWR Stars...) notes that Dymond was instructed to renovate the Swindon stationary dynamometer and implies that this may have been a perfidious move to thwart Gresley's campaign to instigate a locomotive testing station (and to ensure that the GWR played no role in it). Considering this hostile move it is tempting to wonder whether Collett had been castigated for scrapping The Great Bear and had been directly instrumental in arranging the locomotive exchange in 1925 before the LNER had time to introduce improvements to the valve gear on the A1. The performance of the A1 on the Great Western frequently out-classed that of the Castle, but was partly hindered by the poor quality of the GWR permanent way. This latter hypothesis fails to withstand scrutiny, however, as H.A.V. Bulleid Master builders (page 57) implies that Gresley instigated the exchange. He retired in 1941. Peck (p. 236) states "At last, Collett was persuaded to retire. Already 70 years of age, his effectiveness had declined in later years". He had not put much of his energy at the disposal of his employers for the previous four or five years, leaving most matters to his assistants. For most of his term of office he was a widower; the loss of his wife apparently was a long-lasting blow and was followed by his pursuit of spiritualism, vegetarianism, and hypochondria. In the Second World War he unsuccessfully resisted government endeavours to introduce munitions work to Swindon workshops, and it was said that he did not seem particularly interested in who won the war. Collett's isolationist stance was totally unacceptable in a senior professional engineer. H.A.V. Bulleid states that "Collett was an extremely competent man but not easy to work with: he did not like his staff visiting other loco works, and he found it abnormally difficult to place full and relaxed reliance upon the work and reports of his assistants." George Carpenter in the Oxford Companion rightly asserts that Collett made a major contribution to the construction and testing of steam locomotives, and did envisage the progress of diesel traction, and assisted with the introduction of highly successful diesel railcars, but it is difficult not to castigate Collett for the lack of any true advance in locomotive design, especially to assist in routine servicing (Freebury's Swindon apprentice shows the medieval nature of Swindon management), and his failure to co-operate with his fellows, as is shown by his contempt for the Institution of Locomotive Engineers and ARLE. The eventual transfer of Swindon expertise in a fairly haphazard manner to Crewe and Derby under Stanier must have been outside Collett's control.. It should be noted that the vast amount of unneccessary boiler development on the GWR and on the LMS under Stanier would never have been tolerated at Doncaster under Gresley and his successors. Peck is generally considered to be authorative, but is highly damning about Collett in a quiet sort of way: "It was not until after nationalization that the real capabilities of the 'King' class were to be realized and one must question the lack of impetus from Churchward in not discovering this sooner. However, his withdrawn relationship with his staff [KPJ: this is utter condemnation in the case of an engineer] did not encourage the same spirit of co-operation in such matters, as W.N. Pellow, in conversation, made the point that from Collett's appointment, until the time he (Pellow) left for a divisional post, the new CME never once entered the drawing office. Yet Churchward had done so almost on a daily basis." Unfortunately, then Peck goes on to note the "modern locomotives of most efficient and economic design". Really: low superheat, inaccessible inside valve gear, fiddling with the sizes of wheel dimensions, and such wonders of modernity as the 14xx and 90xx classes. Was manual coaling really acceptable in the late 1930s? See: J.E. Chacksfield: C.B. Collett. K.J. Cook, Swindon Steam 1921-1951. 1974. Rutherford, Michael: Great Western 4-6-0s at work. Obituary Loco. Rly Carr. Wagon Rev., 1952, 58, 152. Forty years of automatic train control  the Great Western system. J. Instn Loco. Engrs., 1949, 39, 3-32. Disc. : 33-51. How the Great Western threw away the Churchward legacy. L.A. Summers. BackTrack, 17, 370-6. Relatively briefly considers the transition from Dean to Churchward, especially the development of the extraordinary 4-6-0 No. 36 with its wide firebox, double frames, long stroke cylinders and piston valves. No. 111 The Great Bear is also reconsidered. The excellent Churchward standard range is almost taken as given, but Summers adds that "for me Churchward's most serious mistake was to cling to to inside valve gear". It is noted that F.G. Wright challenged the appointment of Collett, and does not find it difficult to show the lack of locomotive development under Collett and, to an extent, under Hawksworth, although it is accepted that the Castle class gave excellent service and had major influences on locomotive design on both the LNER and LMS. Bibliography. The GWR and Collett (Railway Reflections [No. 25]). Michael Rutherford. BackTrack 11, 36-44. An overall assessment of Collett's contribution which notes the contribution made to manufacturing methods at Swindon, the significance of the AEC railcars introduced during the 1930s and the possible use of Beardsmore electro-diesel power units for suburban trains in London. A report from Kitsons proposed light high speed steam engines (some using a V6 engine) for light work. "Engine 111 The Great Bear Reconstruction. The above engine was built at Swindon in February 1908, and had a tractive effort of 27,8001b and weighed l42tons l5cwt. Owing to its extreme weight, it was necessary for the Hanwell Viaduct (a pencilled correction in the margin says: "the old iron skew bridge over the Uxbridge Road  not the viaduct) to be rebuilt before the engine could be allowed to work between London and Bristol, to which route it has been limited the whole 16 years on account of the enormous expenditure that would be necessary to strengthen the bridges to carry it on other main line routes. Mr Grierson has estimated the cost of doing so at over £500,000. The 'Castle' class of four- cylinder engine has now been produced and proved successful, the engines of which have a greater tractive effort than The Great Bear by 13¼% viz 31,6251b, and as they weigh only 119 tons l7cwt, or 22 tons l8cwt less than The Great Bear, no alterations are necessary to any of the bridges. There is, therefore, no longer any reason for the continued existence of The Great Bear and as it recently came into the shops for general repair and needed new cylinders and a new boiler, advantage has been taken of the occasion to reconstruct it, so that it will be similar to one of the 'Castle' type. "In the past, reconstructions of engines have been dealt with in the same way as repairs and have not been reported to the Directors, but it is thought desirable to do so in this case owing to the notoriety of the engine and to the fact that several British railways followed our example in adopting the Pacific type and are still building them. They have not produced a more powerful engine of less weight." According to Marshall Hawksworth was borm in Swindon on 10 January 1882, where his father was in the Drawing Office, and died there on 13 July 1976. According to Peck, his grandfather was foreman at Coleham, Shrewsbury. He was educated at Sanford Street Boys' School and at the North Wiltshire Technical Schools. He joined the GWR as an apprentice at Swindon in 1898 and was appointed draughtsman in 1905 when he worked on Churchward's Pacific The Great Bear. He became Assistant Chied Draughtsman under O.E.F. Deverell and succeeded him in 1925. In 1941 he became the GWR's last Chief Mechanical Engineer before nationalization, following Collett's belated retirement, leaving Hawksworth little time to make his mark; further, the war years gave little scope for original design work. Hawksworth had been one of Churchward's young men and had designed the valve gear layout for most of Churchward's later locomotives. Unlike Collett, whose experience had been mainly in works management, he was a specialist in design. In 1944 he did what should have been done years earlier, fitting enlarged superheaters to new units of Collett's 'Hall' class 4-6-0. His later 'County' class two-cylinder 4-6-0 introduced a non-standard driving wheel (6ft 3in.) and a non-standard boiler (based, however, on the Stanier boiler that Swindon had built during WW2) working, at the unusually high pressure of 280 psi. This type, of which thirty units were built, was successful, but hardly seemed to justify the departure from previous designs. In his 1500 class 0-6-0 shunting tank he introduced outside cylinders, quite rare for that wheel arrangement, thus enabling the valve gear to be lubricated from the trackside. His larger 9400 shunting 0-6-0 tank was virtually the existing pannier tank fitted with a modern boiler; apparently the GWR management opposed Hawksworth's intention to build more of the latter type, saying that large boiler domes looked old-fashioned. Hawksworth's Principal Assistant was F.C. Hall, a former outdoor assitant.. He was a lifelong member of the choir at St Mark's Church. The other speakers were H.G. lvatt, Peppercorn and Bulleid. Steam Locomotives. The present position of steam locomotives is directly the outcome of a consistent policy initiated by Churchward in the early part of the present century and followed throughout the intervening years in the design of the companys stock. By adopting, as early as 1902, a boiler pressure of 225 lb. per sq. in. superheat, and piston valves with long travel, he set the seal upon locomotive design for the Great Western Railway, and the successful outcome of his pioneer work has been felt on every other railway using steam locomotives. Two main designs initiated in those early years have persisted, with improvements in detail only, up to the present day. One, a two-cylinder, of which William Dean (built in 1902) was the first, has reached its fullest development in the most recent Great Western design, the County class (Fig. 8, Plate 3). The two-cylinder type was also applied to freight work, with no alteration to cylinder arrangement and very little modification to valve-gear details. The success of the early two-cylinder designs prompted Churchward to make the famous comparison with the De Glehn compounds then achieving such remarkable performance in France. The arrival of these four-cylinder compounds on the Great Western Railway proved that Churchwards two-cylinder simple engines were equal in economy to the compounds, but that the four-cylinder arrangement had many advantages for high-speed work. The natural corollary was the design of a four-cylinder simple engine of which the North Star was the first, followed successively by similar four-cylinder engines with large .cylinders, and by the famous Castle class engines, some of which are still being built. The four-cylinder type reached its maximum size in the King class, which ranks among the most powerful passenger locomotives in the country. Oil-firing.. The stringent fuel position arising at the end of the war resulted in inability to obtain sufficient coal of the Welsh quality for which the engines were originally designed; this led to experiments in oil firing. In conjunction with the Petroleum Board and the North British Locomotive Company, oil-firing apparatus was designed and applied to ten 2-8-0 28xx heavy freight engines carrying one of the standard boilers having a 9 ft. 0 in. firebox. The results were highly successful and the experiment was carried a stage farther by converting one of the 4-6-0 mixed-traffic engines carrying the same boiler, with equally successful results. The success of these experiments led to the Great Western designs of details being adopted by all companies as standard. They incorporate a weir-type burner situated under the throat plate, similar to the arrangement originally adopted on the first ten engines. Diesel traction The persistent claims of Diesel-power locomotives to serious consideration led the Great Western Railway Company to purchase, in 1936, one 350 h.p. Diesel-electric G.W.R. standard boilers. Oil Burning. Diesel Traction. shunting locomotive for trial. The intervention of the war prevented an extension of this experiment, but the results have proved sufiiciently satisfactory to warrant an order being placed for a further seven similar locomotives. Consideration of Diesel power for main-line passenger work has not yet led to experimental units being tried in place of normal steam locomotives for heavy duties. Single-unit, Diesel-mechanical railcars and, later, similar vehicles running as twin-sets (Fig. 9, Plate 3), have proved successful for certain specific duties on branch lines or on cross-country routes where high speed and regular service are essential, but the volume of traffic does not warrant running a normal-sized train. Gas Turbines. The high thermal efficiency achievable by the Diesel engine has always been its most attractive feature, but while such high efficiency was accompanied by excessive prime cost, together with the necessity for setting up an elaborate maintenance organization, the net gain did not appear to warrant departing from the orthodox steam locomotive. In the gas turbine, however, while the overall thermal efficiency does not, as yet, attain that achievable by the Diesel engine, its prime cost, even for initial experimental projects, appears to be likely to become stabilized at lower price-levels than those of the Diesel, while no such elaborate maintenance organization is necessary. These considerations, together with the necessity for exercising the most stringent economy in the use of coal, or indeed of any fuel, has led the company to place orders for one 2,500 h.p. and one 3,500 h.p. gas-turbine-electric locomotives. Delivery of both these locomotives is expected to take place in 1949. It is anticipated that the locomotives will equal the performance of the most powerful steam locomotive at present at work on the system, and they are expected to haul the heaviest trains, at the highest scheduled speeds, over the severely-graded routes to the West of England, at a fuel consumption of something like one-third to one-quarter that of the steam engine. Discussion: Hawksworth (62-3) commented upon the balancing machine at Swindon and on the running qualities of the outside-cylinder 4-4-0 County class. On page 68 there was a confrontation between Ahrons and Hawksworth on the swaying experienced with these locomotives. Such open discussion was clearly accepted by Churchward: thus it was Collett who turned Swindon to be an inward-looking institution..
See: K. J. Cook, Swindon Steam 1921-1951 (1974). L.A. Summers gave some biographical information in: Fact, speculation and fiction in the case of Mr. Hawksworth's Pacific. L.A. Summers.Backtrack, 14, 238-44. This last includes some damming comments from K.J. Cook: "an intellectual but not a very enterprising one" and from R.H.N. Hardy: "a jumped up Chief Draughtsman"
Atkins, Philip Dear Mr Stanier, you don't know me but...Steam Wld. 1999. (144), 21-4. In 1965 the author wrote from his home address to several of the retired CMEs to ask them fairly specific questions about their design policy: Atkins was successful and some of his replies are reproduced: as typed for Hawksworth who denied any work on a Pacific and the 47xx boiler was solely intended for that class. In centre of group photograph with other Swindon design staff in days of Churchward at Swindon Backtrack, 2013, 27, 278.